The first nip of cold fall weather elicits excitement about the upcoming ski season from most residents of the Rocky Mountains. Back in the day it felt like more folks were excited for the opening of the deer hunt than the ski resorts, but the West ain’t what it was. I’ve skied, and I really enjoy it; what I enjoy more is winter fly fishing. Some folks prefer to glide/slide/fall gracefully down frozen water on expensive sticks. I’ll take my frozen water inside the guides of a fly rod – another expensive stick. Winter fly fishing is an acquired taste. It takes a special sort of delusion to find the excitement in fishing when the temperatures barely break freezing. Then again, that’s playing off the assumption that excitement is the reason to fish and not just one of many reasons. In the summer, I have to put a few miles of hard hiking between my car and the road to get away from the crowds. That’s not a complaint, but merely a matter of fact about finding solitude in Rockies these days. In the winter, I can stay 50 feet from my car if I’d like and see maybe two or three other anglers out and about. But solitude isn’t the only thing winter fly fishing has going for it. If you take a few minutes to let the coffee warm your hands after stringing up your rod and look around, you’ll start to notice things about the river you don’t see at other times of the year. You get to see more structure, more of the stream bed, more of the prime summer lies and feeding lanes, than when the water – and fish – is up. A few years ago I was out in Oregon a week before Thanksgiving. My fishing buddy Mike and I had made the trek from Utah to hunt for big brown trout. A yearly trip to Oregon is a tradition for Mike and I, and the river we fish is one that never seems to give up all of its secrets. Just when you think you have it figured out and the knowledge necessary to really put the hurt on its trout, it throws you another curveball that puts all your assumptions back into the realm of theoretical guesswork. That year the curveball we got came in the form of low flows. 8 cubic feet per second, to be exact. Normal winter flows for this river are between 25 – 40 CFS. That year’s catching wasn’t too great. When Mike and I returned in the spring, though, we found a river flowing along at just under 70 CFS. The river we saw in November was gone, but the structure beneath its surface wasn’t. Where I remembered seeing in November a big collection of rocks underneath a cut bank was a 23-inch brown trout in March. Where Mike saw nothing but rocky shoreline and thinning weeds around Thanksgiving, he saw thick green moss and a ton of early-season blue-winged olives. And a 22-inch brown trout. The point is that if you apply this same sort of observational logic to your local river this winter, you’ll be able to identify where the fish will likely hold in the summer vs the winter. This is important to remember when you’re looking at a river in winter with the intention of using that knowledge to shape summer fishing. As trout anglers we’re conditioned to look for “fishy” water. Trout like oxygenated runs with cover, cold water, and food. They like cut banks, pools, eddies, and riffles. They’re not the biggest fans of flats unless it’s first thing in the morning or right after the sun sets. But we make all of those assumptions based solely on reading the water, not the structure within the water. Mike and I had such a great time on our return trip to Oregon after seeing the river essentially running dry because we remembered specific pieces of structure that’d likely hold tons of mayfly nymphs. 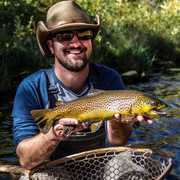 We guessed – because fly fishing is nothing if not an exercise in educated guesswork – that the fish would be in that structure, so we fished the structure and not the water itself. Of course you need to read water when you’re fishing. If you don’t, you’ll end up with flies dragging or missing the seam, or wasting your time casting through a run that likely doesn’t hold any trout. But when you know where specific structure is, you can waltz right up to it and figure out how to reach that structure based on the water level you have to work with. It’s only during the winter, though, that you get to see so much of the river exposed for this type of observation. Since most anglers have more common sense than the select few of us who fish all winter long, not many folks take advantage of the opportunity to learn more about their local fisheries this time of year. Find some wool gloves, add an extra layer under your waders, and spend some time on your local fisheries this winter. Pay attention to what you don’t get to see when the water flows at normal levels. One stretch of a stream just 15 minutes from my house here in Utah has more trash and tires than rocks and weeds in its riverbed. Environmental concerns aside, structure is structure, and I plan on spending a good deal of time on that stream this winter. I want to make sure I know where the best structure is so that when the water rises and I can pretend the stream isn’t a foul-smelling brackish broth, I can catch the biggest fish that call it home. Or, I could stay home with a nice cup of something hot, turn on some episodes of Meat Eater, and wait until the thaw. You don’t really lose either way.